Yesterday we had the Sun running an anti-halal story on its front page under the screaming headline “Halal secrets of Pizza Express”. Not to be outdone in the field of right-wing anti-Muslim scaremongering, the Daily Mail decided to run this story on its front page today. 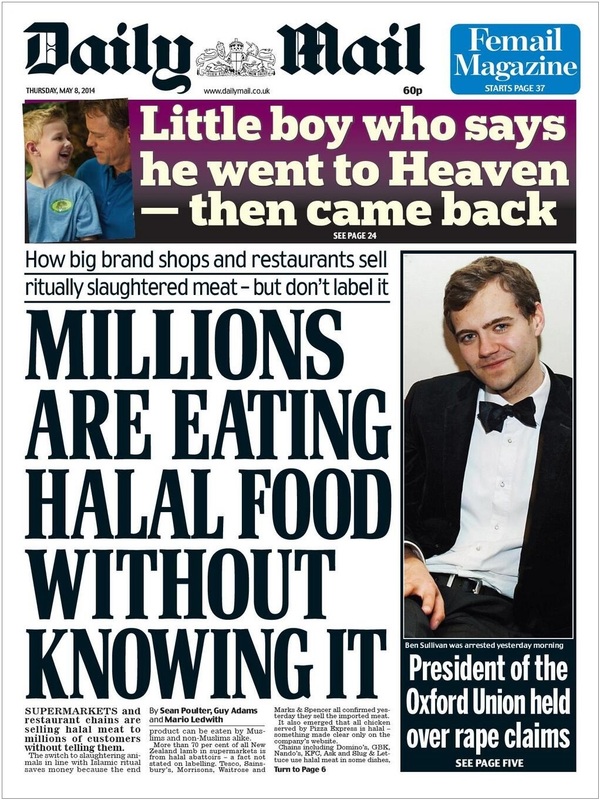 Of course, this is not the first time the Mail has tried to work its readers up into an anti-Muslim frenzy over the issue of halal slaughter by appealing to their ignorance and bigotry. The difficulty the right-wing press faces is that it seeks to whip up hysteria over the supposed cruelty involved in slaughtering animals without pre-stunning (a disputable claim in itself), when in fact relatively few of the animals slaughtered in halal abattoirs in the UK – around 12%, according to the Food Standards Agency – have not been pre-stunned. Elsewhere the figures are even lower. The Mail informs its readers: “More than 70 per cent of all New Zealand lamb in supermarkets is from halal abattoirs – a fact not stated on labelling.” But it doesn’t bother to tell them that the slaughter of sheep without pre-stunning has been illegal in New Zealand since May 2010. So, in reality, the Sun and the Mail are left with the objection that in halal abattoirs a prayer is recited over the animals before they are slaughtered. This is a problem for some Sikhs, admittedly. But they are hardly the target audience for the right-wing press when it incites Islamophobia with such crude and misleading propaganda. This entry was posted in Analysis & comment, Right wing, UK by Bob Pitt. Bookmark the permalink.